3D micro/nanostructures are of growing interest, motivated by their increasingly widespread applications in a diverse range of areas, such as biomedical devices, energy storage systems, photonics and optoelectronics, microelectromechanical systems and metamaterials. The previous approaches of 3D assembly are compatible, however, only with a narrow accessible range of materials and/or 3D geometries. We developed a new mechanically-guided assembly approach using compressive buckling, for constructing complex 3D micro/nanostructures from 2D micro/nanofilms. This approach applies not only to a broad set of materials (e.g., semiconductor, polymer and metal), but also to a wide range of length scales (e.g., from 100 nm to 30 mm). We devised various design concepts to increase the accessible topologies of this assembly approach. To understand the underlying relations between the 3D buckling configurations and fabrication parameters, we are also interested in developing mechanics models of postbuckling for the thin films. In addition, we explored the various interesting applications enabled by these 3D mesostructures. Development of advanced synthetic materials that can mimic the mechanical properties of non-mineralized soft biological materials has important implications in a wide range of technologies, such as tissue engineering and biomedical devices. However, this area has received far less attention compared to that of hard, mineralized biological materials. 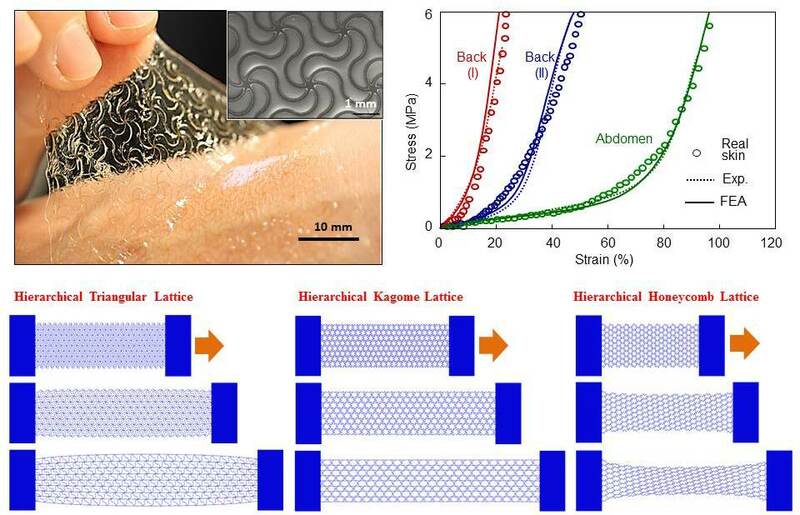 We have established deterministic designs of soft, biomimetic network materials whose stress/strain responses can be tailored precisely to match the non-linear properties of human skins. We also developed a theoretical model of such network materials that enabled rapid optimization of network materials for reproducing the desired stress-strain curves of human skins. We are currently studying other material systems, and exploring their engineering applications. The traditional health monitoring instruments in hospital are usually rigid and cumbersome, and are not able to adhere to the curvilinear, time-dynamic surface of human skins. As such, the traditional instruments could not offer the option of continuous, long-time, health monitoring out of hospital. To develop wearable electronic devices that could integrate seamlessly with human skin, especially those involving energy storage components, the high stretchability, high functional areal coverage, low modulus and small size represent a set of important attributes. Most of previous designs, however, could not well combine these attributes in a single system. We are interested in developing novel structural designs of hard/soft integration to achieve the above goal. An example involves the development of self-similar design concepts in ultra-stretchable electrical interconnects, which enhance tremendously the system-level stretchability while maintaining high areal coverage of functional devices. 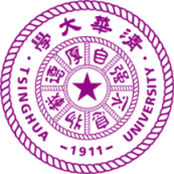 We revealed the mechanism of ordered unravelling during the postbuckling process, and developed both analytical and computational models for predicting the mechanical performances. 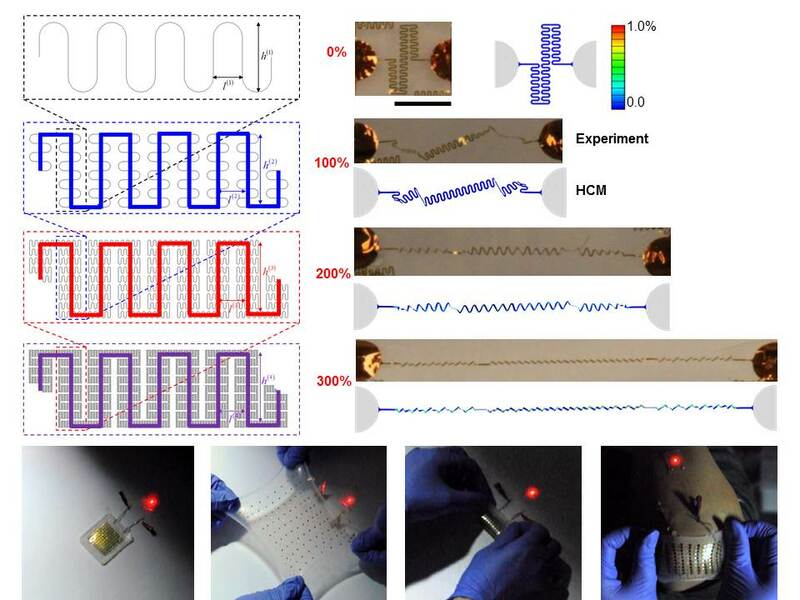 Based on the self-similar design concepts, we developed the first stretchable lithium-ion battery which can be biaxially stretched by 300%, as well as a thin, conformable device technology that can laminate onto the surface of the skin, to enable advanced, multifunctional operation for physiological monitoring in a wireless mode.